You know what’s fun? Gaming expos, that’s what. We don’t have all that many of them happen down here on this end of Africa (or probably in Africa in general), but at least one of what we have is pretty good. That being rAge – which runs every year over a weekend in October (for the last, like, I dunno, 11 years or something), showcasing all kinds of wonderfully geeky, techy, nerdy, and gamey type things. That, and it plays host to a kickass BYOC LAN (the NAG LAN @ rAge), which every year for the last few years is the largest held in the southern hemisphere (as far as I’m aware, anyway). This is my eighth attendance, and I thought I’d write something of what I saw here over day one, Friday. After a bloody hot drive and time lugging my gaming rig from home to the LAN (we’re having some infernal heatwave at the moment, so this was not the most pleasant experience), I got my system set up and then went off to met up with a buddy or four to check out the expo floor for the day before scuttling to the LAN for some of that big-hall videogaming. To start with, the show exhibitors often have some great event pricing on hardware and games and lovely geeky bits and pieces, and hour one was spent in line to take advantage of a 5-games-for-R20 leave-of-sanity by one CNA. I picked up Assassin’s Creed: Black Flag, GRID Autosport (x2, one for a friend), Call of Duty: Advanced Warfare, and Kane and Lynch: Dead Men. Some I have not played, others I pirated a while back, enjoyed, and thought I’d like to have them for realsies. After that, and the procurement of some always-so-damn-expensive expo-sustenance, I braved the queue for a little Oculus Rift demo. Now, this was the first time I’d ever strapped one of these things to my face, and boy do I want more! The demo itself was one of the usual roller-coaster ride affairs that seem particularly popular as devices for showcasing the VR experience. I was lucky enough to be dropped into the second half of the demo, so there’d be no gentle build-up and acclimatisation for me, oh no! It was all loops and spirals and dips and speed from the get go, baby! The demo was done on a Dev. Kit v. 2 of the Rift, and while resolution of the display seemed low and the view “grainy” (in a “I’m too close to the screen and can see the pixels” way), the experience had me tilting back and sideways and looking this way and that, along with the sense of vertigo and exhilaration I might expect of a high-octane roller-coaster but minus the wind, chair, and other by products of the actual physical experience. Luckily, I had no motion sickness trouble and didn’t see any noticeable latency in the translation of my movements to the display, but I did tilt a little precariously here and there and have the thought that I really should have been sat down for this first hit. Particularly when the taller peaks dipped to reveal their gut-clenching height and sent me hurtling, weak-kneed, down their spiralling descents. I left hungry for more, and will be braving more of those queues on Saturday. Not pictured: me playing the demo I played. Following that, I sat down with some friends to have a go at one of their new acquisitions: the Zombicide boardgame. I’m not the most prolific boardgamer, but I enjoy playing them and the tabletop can bring about some terrifically fun multiplayer experiences. Zombicide has players direct their survivors (in our game, two for each of the three of us) through a tiled map to battle and escape from the multitudes of ever-spawning zombies. The map is constructed by the GM out of preset tiles, so the game can facilitate large or small scale campaigns. Play follows rounds in which each player takes a limited number of actions for their avatars, from moving to attacking zeds to rummaging about in locker rooms for supplies, while at the end of each round the zombies will keep on approaching, attacking, and spawning in greater, more dangerous, numbers as play continues and the more zeke’s the players off. Linger too long or keep engaging in battle, and you’ll quickly find yourself becoming overwhelmed as more and tougher zombies enter the fray and your gear and abilities do not keep up. We learned the lesson of not lingering the hard way, after sacrificing one of our number to the undead hordes to make our break to freedom. I had a lot of fun with this one, and while it may take some play to really get comfortable with the mechanics, once you do gameplay flows quickly and does a great job of giving you an exciting, tense zombie survival game. All those yellow figures on the board? Yeah, zombies. Next up, I tried out the closed beta of Rainbox Six Siege. I enjoyed the Vegas series of games and have been looking forward to Siege as a hopeful return of the kind of tactical co-op campaign I’d had so much fun with before. Now, the beta setup was 5-vs-5 cops-vs-robbers hostage situation and not exactly the game mode I’m all that keen on, but I queued to give it a go anyway. Honestly, I walked away unimpressed. But, I don’t think I’ve played the game in it’s most favourable light. Being plonked into a game like this with no tutorial or introduction to any of the mechanics, skills, and other traits of play really does a disservice to the kinds of experiences Rainbow Six, and Tom Clancy games generally look to provide. While movement and general play worked fine, the lack of familiarity with the skills, abilities, and possibilities the characters and maps can provide makes for a confusing, disjointed experience as one naturally jumps in with a mentality of “well, I hope my movement and guns do the trick ’cause I have no idea what the rest of this stuff does” and, frankly, movement and guns will not do the trick. Siege is to be a carefully paced, methodical game where every option at your disposal needs to be used to achieve victory and it takes time to learn what works. Basically, I game away having an unsatisfying game but saw enough to still be interested in getting to know this game that I think will still scratch my slow-play itch (if I just let go of my Battlefield play mentality, that is). 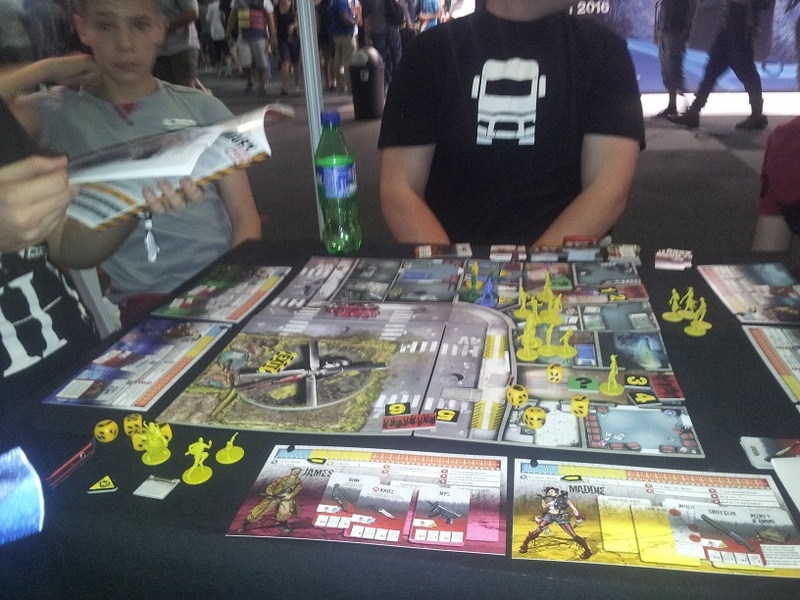 Last in the expo for Friday was another board game, in the form of the tabletop-skirmishing Star Wars X-Wing. 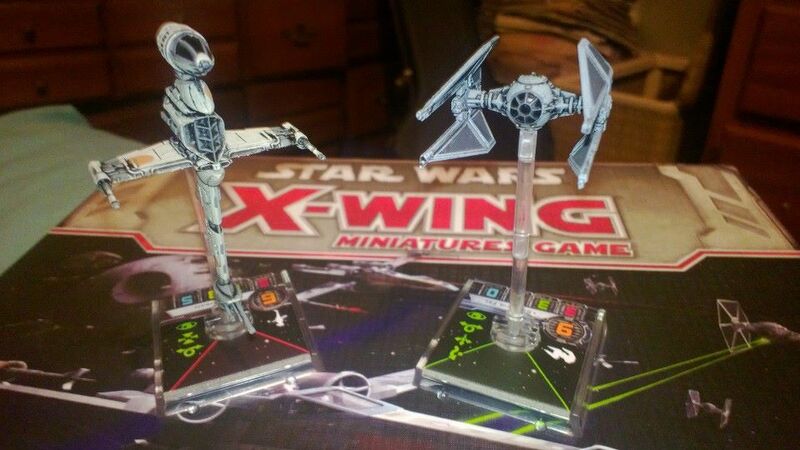 A friend and I sat down with a most friendly bloke at the Unplug Yourself stand to learn about this interesting-looking thing we happened to see him playing, and played out a short Tie Fighters vs. X-Wing battle. Essentially, each player directs the movements and actions of their ships, each turn moving them about the play area to outmanoeuvre their opponent and get a good firing line on the enemy’s ships. Movement is handled by each player pre-determining the kind of move they want each ship to do (straight moves, curves, tight turns and that sort of thing, of varying distance), followed by action and attack phases where ships take what actions (like locking a target or doing a barrel roll) are available and shoot at whatever might be in range. The both of us came away having thoroughly enjoyed our brief, strategic skirmish, and may well be picking up the core set and a few extra expansion ships to play this some more. Also not my own photo, but eh, close enough. That was Friday at rAge as I spent (roughly, anyway), and I might throw another post up in the wee hours of Sunday to talk about Saturday. There was tons more to see and do on the show floor, but I’ve been at this thing many times now and tend to be selective with my queuing. There’ll certainly be more VR on the agenda for me on Saturday and Sunday, and I have my eye on the products of a local artist and author or two, so this is just a sampling of what I chose to taste. 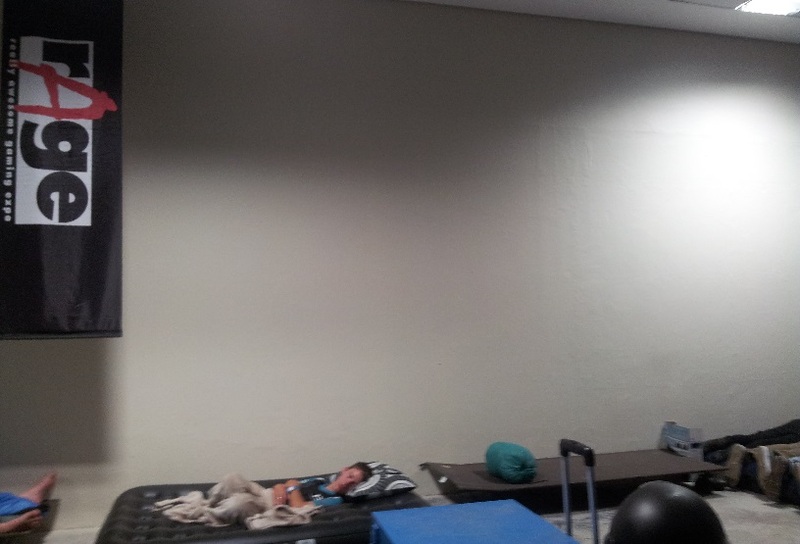 But now I’ve played some great Left 4 Dead in the LAN and I’m knackered and it’s time to crawl into a bag on a stretcher.